The Mission Beach Resort Bistro caters for the entire family and is open 7 days for breakfast, lunch and dinner. Choose from our A La Carte Menu and Chef's Daily Specials Board. Pizza is a specialty and can be ordered 7 days a week through the Sports Bar. We also offer a sports bar menu for lunch and dinner 7 days. Bookings are recommended – please phone 07 4088 8288 to reserve your table. There are two bars available for general patronage at the resort, the Gaming Bar, which used to be the longest bar in the Southern Hemisphere and the Locals Bar. Both are open from 10am daily with complimentary coffee and great service on offer in the gaming bar and load’s of entertainment in the Locals Bar. 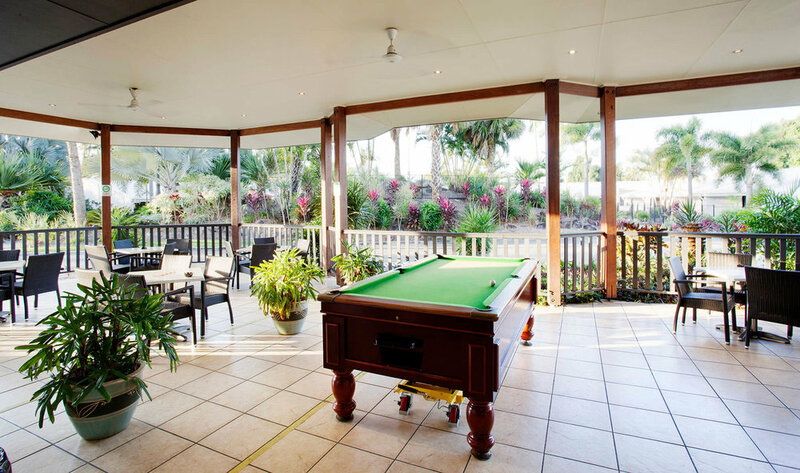 Proudly offering TAB and three Fox Sports channels, two standard sized pool tables, a jukebox, big screen T.V.’s and an a la carte menu. Locals Bar Style to cater for you and your friends from 12 - 2pm and 6 - 8.30pm daily. Our Gaming room features 33 of the latest gaming machines, Keno terminal, and link jackpots including the latest Lightning Link Machines. We have Ticket in Ticket Out system operation on our machines allowing you to move quickly and easily between machines.